Have you ever had something that you needed to do, badly, but never seemed to remember when you actually had the time? 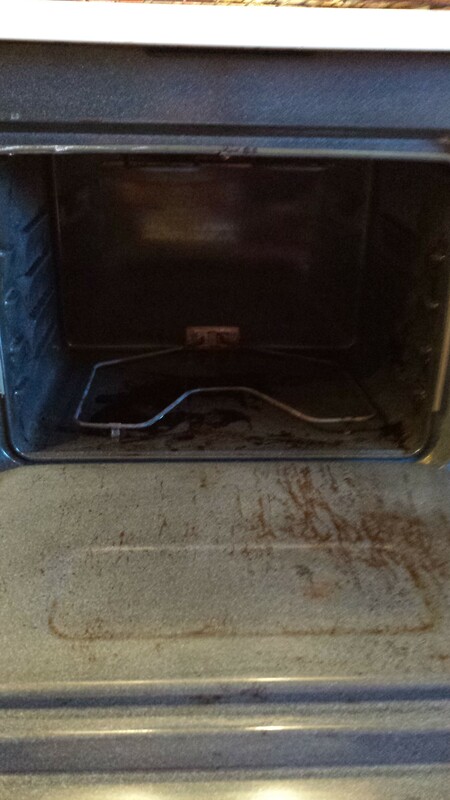 That thing for me lately has been cleaning my oven. 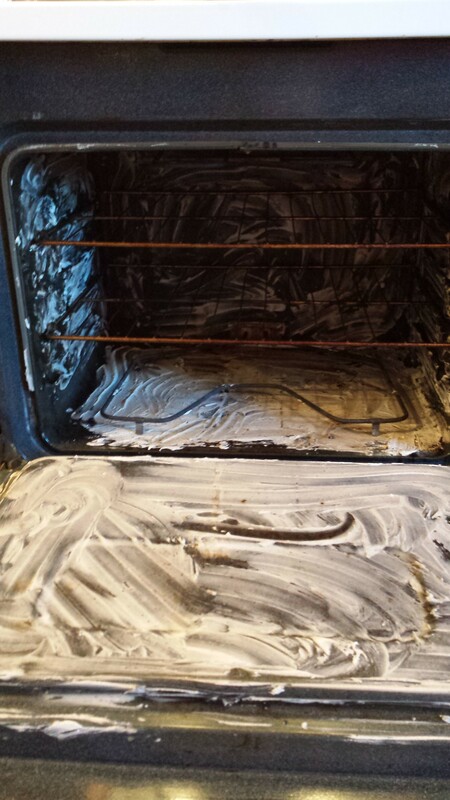 I’m guessing this is a common problem- assuming you don’t have the self-cleaning oven. (which by the way, is now on my wish list). I always seemed to remember that I needed to clean it when I was cooking something and airing out the house from the smoke of it…..
Not the most fun way to spend your evenings. Months ago, I had pinned a natural oven cleaner so last night I decided to give it a go. I wanted to get it on in the evening and let it sit all night to wipe out this morning. It was a super easy recipe to mix, and I had all the ingredients. Being the baker at heart that I am, once mixed, it reminded me of frosting. (yes, it did make me want to take a bite but trust me, I didn’t. Although my dog, Lady, watched me very closely the whole time). All it took was some dish soap, a lot of baking soda, a bit of salt and vinegar. I did add water to make it easier to spread. It was suggested to spread with a pastry brush, but as I didn’t have one, I got genius and used, errr… well. I just put the shelves back in for overnight. Shrug. Come this morning I put on grubbies, grabbed a rag and went to work, very hopeful that all I would have to do was wipe the cleaner off and I’d have a sparkling clean oven. I didn’t take into account how much work it would be just to get it all off! Being as it’s made from soap and baking soda, that stuff spreads quite happily. Heh. Scrub. Wipe. Get up and rinse cloth out. Repeat. A bit more elbow grease and the rest will come up – but it’s the best that it’s looked since I moved in – almost a year ago now!!! – so I’m proud of it. And will use the natural cleaner again. So this pinterest test is a WIN! My next project for the oven is cleaning the shelves and the burners, and something to do with car wax on top….. stay ‘tuned’ for the rest of this set of cleaning pinterest tests! Yay for chemical free cleaning!!! Thanks, Laura! Looks good, I got it pinned!